Worked well for our needs. 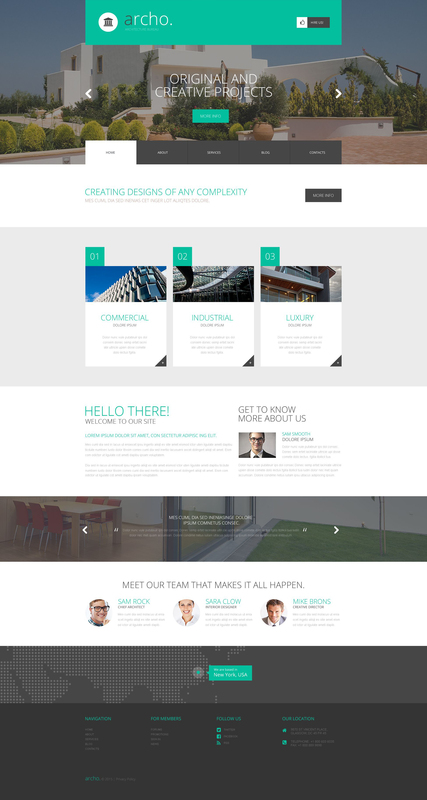 Archo is a clean and minimalist design best suited for architecture and real estate companies. Being flexible and easy to customize, the theme allows creating and managing new pages, posts and portfolios with ease. Intuitive from inside and out, the design offers both site owners and its visitors enjoy smooth browsing and simple customization. The admin panel allows changing almost every element of the template, from fonts and colors to post formats and backgrounds. When built with this retina ready and fully responsive theme, your site will look super sharp on any device. Is it possible to use your WordPress templates for Architectural Contractor to develop websites for my customers? After Home & Family Services WordPress theme purchase you can put your copyright to the template. But you cannot place a line at the bottom (or any other spot) of the customized project saying "Website design by Company name". Nevertheless, you can place "Customized by Company name". Without the possibility to rely on programmers anymore, it is fantastic to see how fast and well the TemplateMonster support team are helping me. Their good support and that they are available 24 hours makes me decisive on continuing using TemplateMonster. Really the purchase process was simple, files and came complete installation process took place without complications. The only thing you had to install some plugins to complete the installation and see the system perfect, as shown in the template, but the documentation does not explain this step, .zip files are in the folder include , what was done, take them out and install the wordpress admin and go.